SANTA MONICA, Calif. (September 11, 2013) — As part of its ongoing efforts to provide the industry with resources on the latest recording technology and methods, The Recording Academy® Producers & Engineers Wing® hosted a Digital Audio Workstation Master Class on the new Pro Tools 11 on Thursday, August 15, 2013, in partnership with AVID Technologies and Westlake Pro. Video of the event will be available for viewing on The Recording Academy member website www.GRAMMY365.com on October 1, 2013. 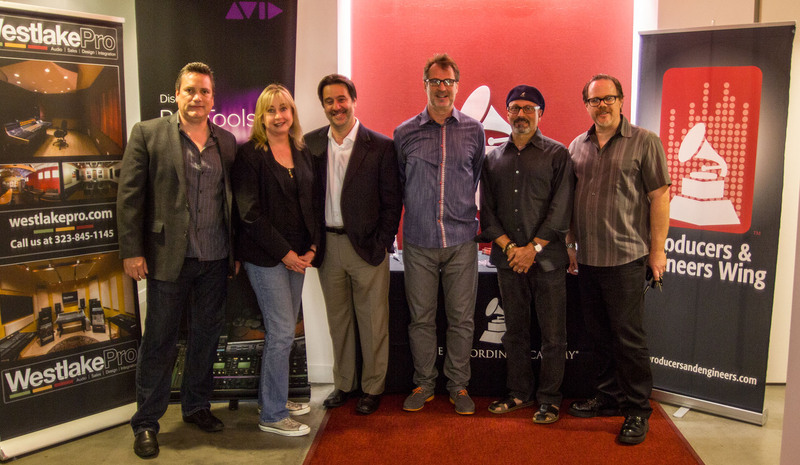 Pictured L-R: Joseph Taupier, President Westlake Pro, Inc.; Maureen Droney, Senior Executive Director, P&E Wing; George Adjieff, CEO Westlake Pro, Inc.; Collyer Spreen, Pro Audio Solution Specialist, AVID Technologies, Inc.; Brian Malouf, Producer/Engineer & LA Chapter P&E Wing Committee Co-Chair; David Casey, Partner Account Manager, AVID Technologies, Inc. Photo by Bowen Sanders. Photo courtesy of The Recording Academy®/Bowen Sanders. © 2013.